Thank you Bill Gates for propping up Apple with that $150 Mil investment and making ie for Mac after John Sculley and Gil Amelio did whatever they did to/for Apple. Check out “Preston, Gates & Ellis”. Throw in Abramoff too. Lots of Washington scandals there. 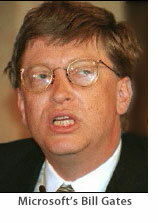 Gates would sit in his cabin and try to read Mac OS Discs? That’s creepy and hard on the eyes! good luck & good speed on your philanthropic endeavors, bill g.
I guess the site name contributes a bit to the confusion of some readers. MDN is a news aggregator and the added value (perceived, subjective) is the MDN commentary. You will rarely see a verbatim repring of an entire article there. There will always be a link to the source, though. My only gripe (and it seems to be common among the regulars here) si that MDN takes, as they are sprinkled throughout the text, aren’t always easily separated from the original text (or quote thereof). A suggestion would be to perhaps colour your quotes in, say, <font color=purple>purple</font>, or <font color=green>green</font>, or something other than black or blue. Not much of an effort to do it, but it would make it easier for us to read. I guess the old <font> tag isn’t allowed on MDN… At least not in the comments section; but I’m sure you’ll be able to figure something out for your own story section. “From Microsoft’s start in 1975, Gates has been the company’s genius programmer, its technology guru…” etc. etc. Typical hagiography. Seriously, I don’t think Gates as a programmer could hold a candle to, say, Sun’s Bill Joy or Bell Labs Thompson or Ritchie. UNIX (which underlies OS X) was long ago created and nurtured by Ph. D. computer scientists. DOS and Windows were concocted by a college dropout. Once you understand that, much becomes clear. For once I agree with MDN’s “takes,” though I would say that Bill Gates is more like Rube Goldberg. I would like to suggest that you put things like “Mintz continues” (in this article) in blue so that it’s easier to see where you stop and the article starts up again. Years ago, Bill Gates said he would quit when it wasn’t fun any more. That sounds ominous for Microsoft. MDN – You cracked me up GOOD on this one! And, just to be clear, you’re right on about Microsoft. Rip-off city! Wow, a definition of MDN itself. An adsite, sorry website, with content buried inside a layer of crap covered commentary”.